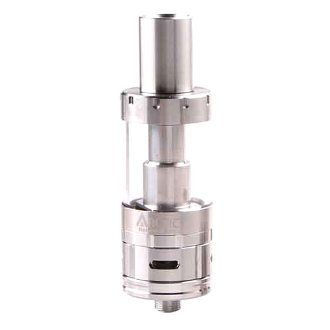 The Arctic sub ohm tank clearomizer (aka the Arctic) is the first commercially available .2 ohm tank. The Arctic comes with sub-ohm vertical dual coils that are made with 100% organic cotton and 100% USA made kanthal wire. The coils have two huge juice intakes and have four air intakes on the bottom of it as well. The clearomizer itself has a four-hole airflow that can be adjusted with a standard twist to change your air restrictions and flow. The combination of the air intakes on the coils and the airflow on the base of the Arctic, gives you an easy breezy beautiful cloud of vape. Note: allow the coil to sit in the liquid for a minute before using. That way your wick will be properly primed and there will be no dry burns. Like with any usage of an electronic, there is always a risk factor if the product is not handled with precaution. We HIGHLY suggest only using this product if you are an experienced vapor. Before you begin using the Arctic there are some things you should be aware of; your amp limits on the batteries you're using, the voltage on those batteries, and check the resistance on your coils.